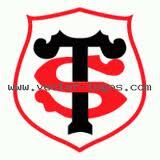 It’s semi-final day–Castres Olympique play Le Stade Toulousain in Toulouse today. Rugby of course–this is SW France where the game is a religion–and the end of season play-offs for the Coupe de France. Dominique’s cheese stall is flying the flag for Castres Olympique early this morning and blue pendants are hanging from all the lampposts in town. There’s a special edition of the local paper (a cherished keepsake–if they win!). Our cheese man is a master conversationalist (bavadeur). 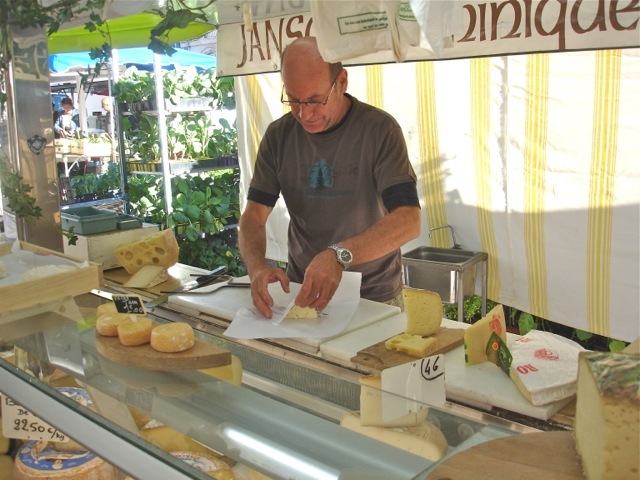 He thinks nothing of letting a long queue build up as he pursues a subject that takes his fancy–wrapping a piece of cheese with a lovely flick and fold routine the while. When there’s no more fun to be wrung out–he reluctantly weighs the beautifully wrapped cheese and takes payment, at last raising the hopes of the next in line. “Vous allez y aller, ce soir?” [You going tonight?] I ask him. There’ll be a giant screen in place for those supporters not going to Toulouse tonight–about a 50 mile drive–and if the atmosphere’s anything like it was when we watched France win the soccer World Cup in 1998, it’ll be a riot–and this is only the semi-final. I doubt the man in black is a Toulouse supporter, more a convenient (and willing) stooge for Dominique’s on-going performance! On my route home I stop at the roundabout close to the Castres Sapeurs-Pompiers [Fire Station] to let four fire vehicles pass–no sirens or red lights flashing–so clearly no emergency; just blue and white balloons streaming from every opening, some falling and bouncing gaily by the roadside as the shining red convoy proceeds on its circuit round the town. When you talk about Lautrec, is it where Toulouse Lautrec , the painter came from? Was his father a count there? He was born in Albi–35 minutes from us–and his family originally owned huge stretches of the lands from Toulouse going east. They were the Counts of Toulouse-Lautrec. You have your rugby – we have our Julie-Bee weekend (as some befuddled person said to me the other day!). Can you send some sunshine for the river pageant tomorrow, please? Celebrating early it sounds like! Nothing to do with Rugby I’m afraid but while shopping today at Talensac Market in Nantes I noticed for the first time ‘Garlic from Lautrec’ . Thank u for educating me Robin! The new season crop is looking almost ready and the farmers are lopping off the flowers–not long to go now. Although I have no idea of Rugby but I can imagine the excitement before the big game. We had a amazing atmosphere here in Munich at the CL final but the ending was very depressing for us. I was so happy to got hold of a ticket in the draw but after the game I asked myself why I have to care about football ? Therefore, my anticipation for the upcoming European Football Championship developed only slowly. But France is one of my personal favourites ! I hope Dominique isn’t too disappointed that his side didn’t triumph. Maybe next year. That’s helpful and good to know. Bavardeur means perhaps more of a prattler… I meant to look up the spelling and in fact had cut out the “r”! Anyway–thanks.